The theoretical, critical and, in general, not-for-performance texts on this page are pdf files (except for The Satyr-Play(-Like) where the link takes you to the text as published in Didaskalia-The Journal for Ancient Performance): left click to open in a new window or right click to download these pdfs. There are also links to the video of a lecture on staging ancient Greek tragedy today. This text explores the question: what is the potential of ancient fragmentary plays for theatrical performance today? This really involves two related questions. Firstly, how, in practical terms, can such (often scanty) vestiges be performed? Secondly, what is the broader cultural significance of the attempt to perform them. (Playing (With) Fragments draws a comparison with performance of the fragments of ancient Greek music, so here’s a link to the work of Stefan Hagel where you can follow that topic up). theatre embodied in it. This text does not focus on fragments, but provides background and context. An account of a four week long project in which two groups of students were given the task of creating a play about Niobe based on or inspired by and incorporating (most of) the fragments they had been given; in the case of one group these were the fragments of Aeschylus’ lost Niobe and in the case of the other group they were the fragments of Sophocles’ lost play Niobe. This is a lecture I gave at the Athens Centre in October 2012 about the various issues involved in staging ancient Greek tragedy today. Actually, this image is ‘cheating’. 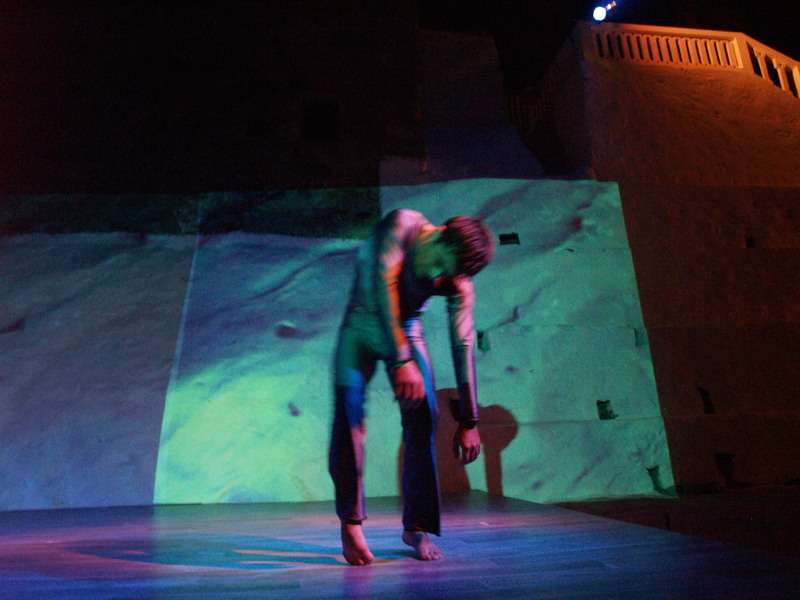 It’s from an outdoor dance performance I directed, part of a multi-media event, ‘An Evocation of the Apocalypse,’ for the 10th Festival of Religious Music, Patmos, Greece, 2010. (Music: Bruno Libert and Diane Sutherland. Vocals: Diane Sutherland. Design: Maria Pesmazoglou. Video: Giannis Nikolaou. Dancers: Giorgos Tsombanidis (pictured) and Raphaela Petrai.) I just like the way the balcony (top right) suggests a ‘looking down on’ – but with no one there!